Store bought costumes are so ordinary. This Halloween be extraordinary and create your own costume. Today we’ve taken a few classic costume ideas and given them a stylish twist. The great thing about creating your own stylish costume is it will be one of a kind and you can easily wear the pieces in your day-t0-day wardrobe. Who’d of though prison stripes could be so chic. Well with this prisoner costume you’ll be doing time style. Find yourself a stylish black and white striped dress. Accessorize with handcuff necklaces and bracelets. Add some chain bracelets and dramatic dark make-up. Need a fun hair idea? Wrap your hair around empty coke cans a la Gaga in Telephone. It’s the jail version of curlers. A 20’s flapper is a classic and cute Halloween costume idea. And it’s so simple to recreate. All you need is a fringe dress, feather hair piece, fishnet stockings and layers of pearls. Don’t forget a sparkly bag and to smear on a red lip. As for hair try out this cute vintage hair do by Lauren Conrad and for makeup try this tutorial. Got a red dress sitting in your closet? 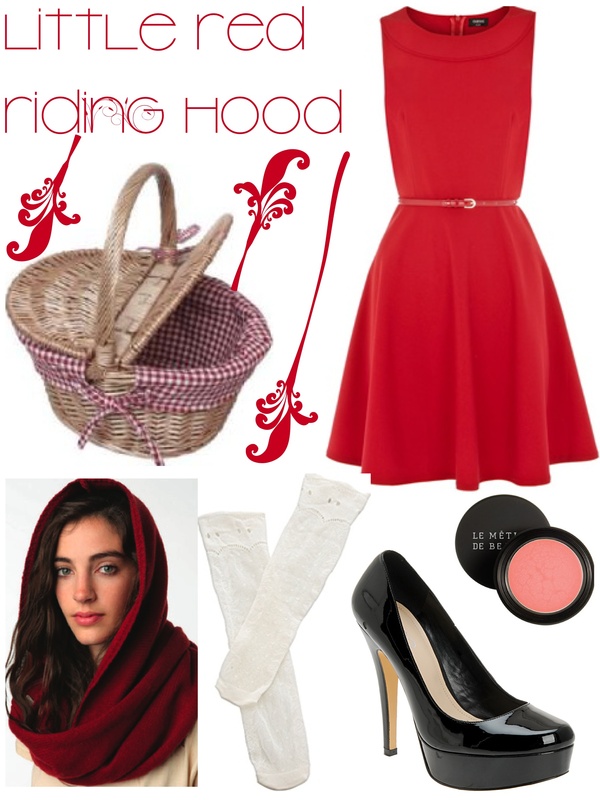 Well it’s so easy to turn that red dress into a Little Red Riding Hood costume. Add a red hooded scarf or a red hooded cape. Pair it with white knee-highs, basic black pumps and don’t forget the basket. This costume is sweet and demure. Have your make-up reflect that with pinks on your cheeks and eyes. Check out this make-up tutorial for more tip ideas. Now all you need is a big bad wolf. Mermaid is a great cute and stylish costume idea. Plus it’s so easy to make. All you need is a green maxi skirt and a bikini top. Accessorize with sea-themed jewelry like seashell necklaces, fish rings, and coral pieces. You can buy seashell jewelry or do it yourself. My favorite thing I found are these sea-themed fake eye lashes. For your hair keep it natural with beachy waves and pin in sea shells. Or try a fish tail braid. Check out this tutorial for mermaid inspired make-up. Which classic look is your favorite? What will you be for Halloween this year?